The next day we woke up to sunny snow cover and frosty conditions. Fortifying ourselves with breakfast at Best Westerns (hash browns, eggs, toast and pancakes) we were ready to take on our hike again! We negotiated a lift back to our trail and were soon hiking on trails in the crisp post storm air at 9000 feet. 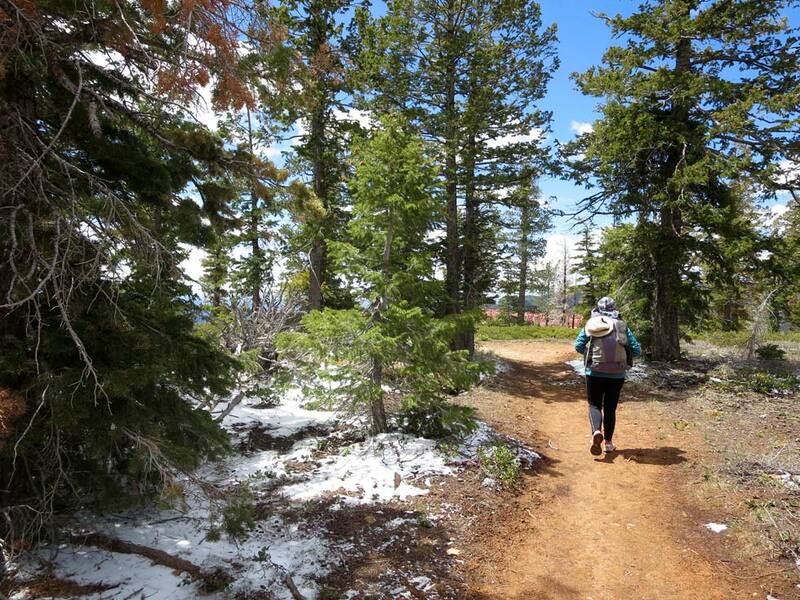 Dropping down from Rainbow Point to ‘Riggs Spring’ brought us below the snow line to warmer air and lush green scenery of Ponderosa, White Fir, Douglas Fir, Manzaneta, Juniper and Pinyon. Heading on south out of the national park we hiked on jeep tracks through more open but still pleasant country. We headed away from the jeep tracks into Bullrush Gorge which started as a dirt banked dry river but turned nicely into a steep sided gorge but this time with broken sides and trees growing from the walls. Deciduous trees here included oak and mahogany. It’s amazing how every canyon has it’s own character. It’s always cheering to find water and Adam’s Spring didn’t disappoint- water flowed clear and healthily into an old bathtub just off the trail. 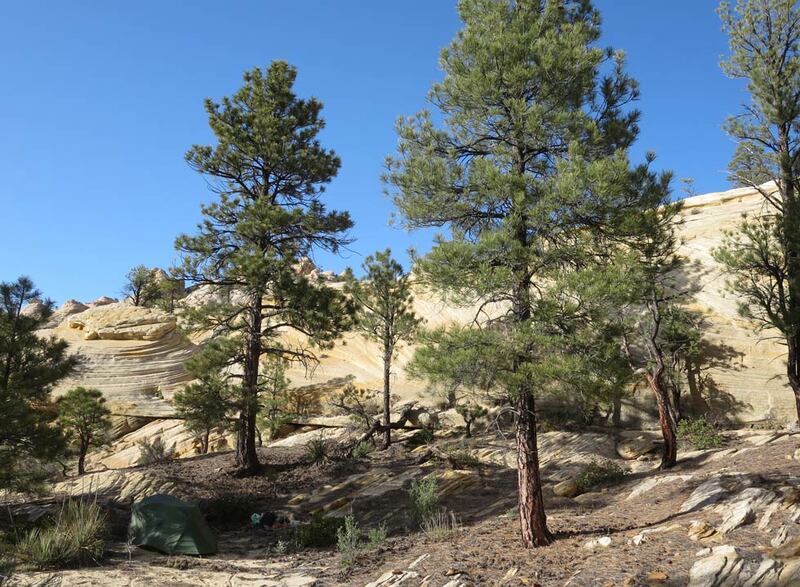 Our campsite was a mile or so south from here amidst some great sandstone tepees and we scrambled up the rock to have a splendid dinner amidst rock and ponderosa. Excellent day! Another cold clear frosty morning and we headed off at 7.40 with the aim of reaching the highway early enough to hitch a ride into the town of Kanab. 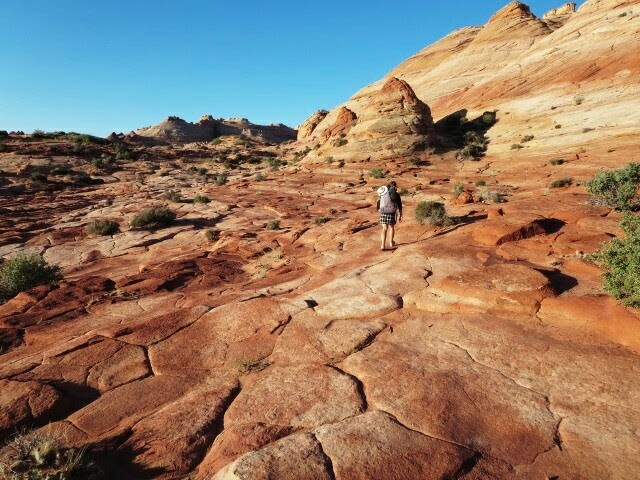 Hiking here was down a sandy bottomed wash to No Man’s Mesa. The wash had maybe 10 feet high dirt banks topped with sagebrush and there were lots of cows around. The views to the surrounding white vertical cliffs were great though. After a couple of hours we hit a windmill (not working) and better jeep tracks following a terrace above a wash. The valley was filled with a carpet of green grass and sage. BLM have signs marking restoration work done here which looked like it is having a positive effect. Making good time on the jeep tracks, we meet two guys looking at artifacts from Indian settlements for BLM. They agreed to give us a lift into Kanab which we welcomed as we thought it might be a difficult and lonely hitch out here! Kanab is a cool town but with a slightly pre-season feel to it. We checked in at the small Travelers Motel on the east side of town and it was a great place for us -sitting outside the motel munching bagels happily into the evening! 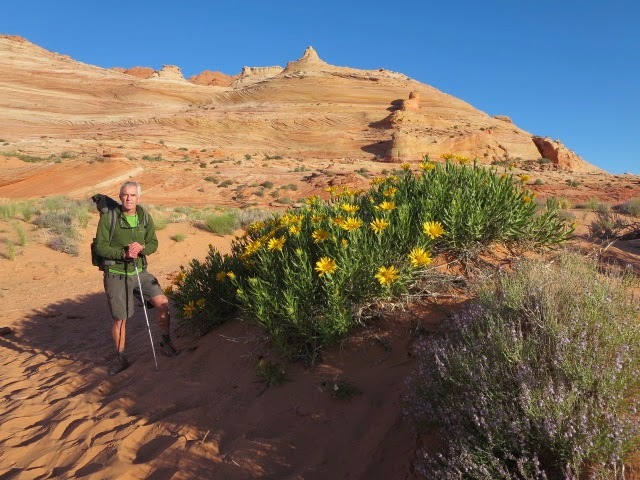 We get a ride back out along Highway 89 in the morning and are soon hiking down Buckskin Gulch in much warmer temperatures now. The upper gulch is all beige limestone with marine fossils a-plenty. We popped out to the dirt road of Buckskin Gulch trailhead. It was broad to start from there but with lovely red walls and swirly layers of sedimentary rock. 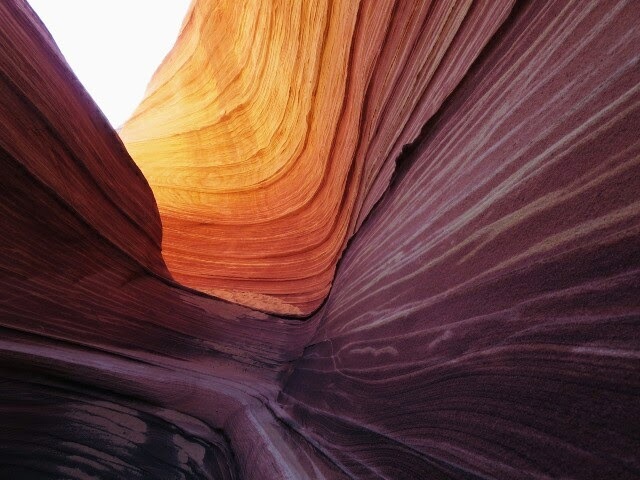 We were back in the familiar (and favorite) red gold and orange sandstone layers of Navajo, Kayenta and Wingate. 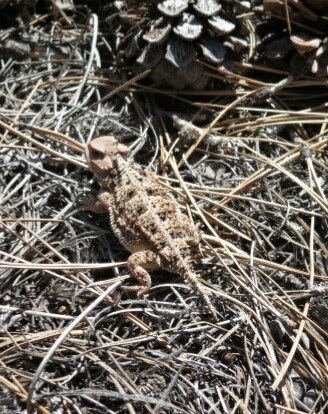 The heat was intense now in the afternoon and we lunch in the shade under a juniper. Soon we are hiking down the narrow canyon of Buckskin itself and reach a junction where the Hayduke heads off to ‘Wire Pass’. 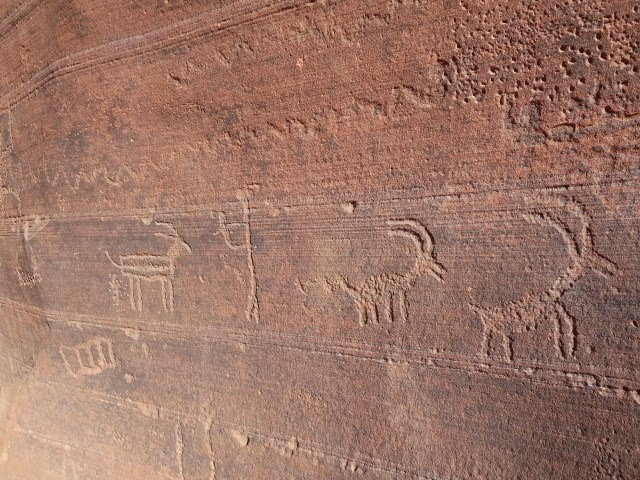 There are interesting sheep petroglyphs here. 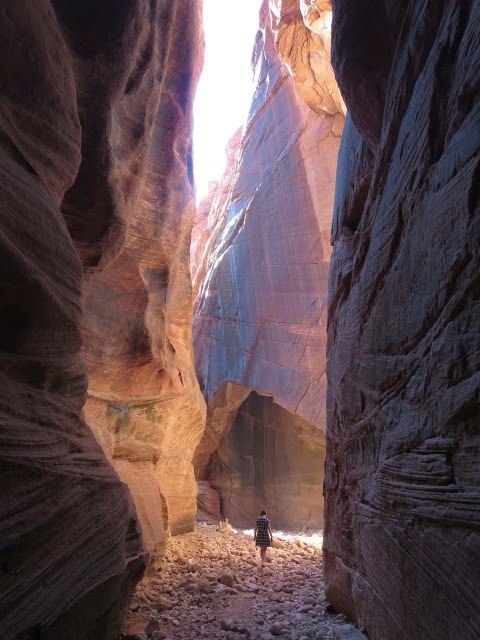 We drop our backpacks and head further down Buckskin Gulch ( a canyon famous for its continuous 12 mile slot and it’s beauty) for an explore. Returning back after a couple of hours of amazing canyon shifting light and reflected light on steep red walls, we vowed to return someday to do the full Buckskin and lower Paria Canyon traverse down to the Colorado river or as a long alternate loop of the Hayduke. We set up a camp nearby after carrying water from town for today and most of tomorrow. An alarm at 5.30 am went off this morning ready for a visit to a beautiful sandstone area called ‘The Wave’ in the early morning. 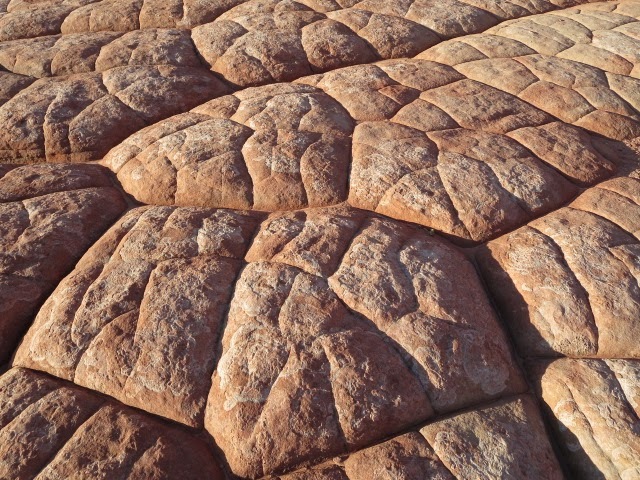 We walked amongst glorious sculpted sandstone slabs and spend a relaxing hour or so wandering around the scenery. Fantastic and it was nice to enjoy it with no-one else around! From ‘The Wave’ we continued up valley on sand, slabs and rocks to reach a notch on a rocky ridge. The descent westwards down from there was a bit difficult and we had to retrace our steps on one occasion to get round a dry water pour off cliff. Lower down we find a trail and relaxed as we dropped down to a dirt road. A guy in a pickup stopped to ask us if we needed water, which was very kind of him, but as it happened, we were carrying about the right amount now to get us to our next mapped water source 2-3 miles away on good trail. We didn’t want to carry any extra weight so reluctantly said no to the water. One mile of the dirt road in hot, dusty conditions and we reached the Arizona/Utah border at the end point of another more famous trail- the Arizona Trail. There is a campsite here with shade, tables, benches and a privy(!) but no water and we had a late morning rest here in the shade. 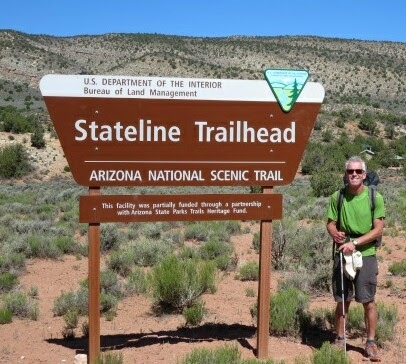 Around 11.30 we set off south on the Arizona Trail and marvelled at the well constructed easy path we were now hiking on as a contrast to the rougher normal way on the Hayduke. An actual trail to hike on with sign posts and no bushwhacking! -walking was easy now for a while! 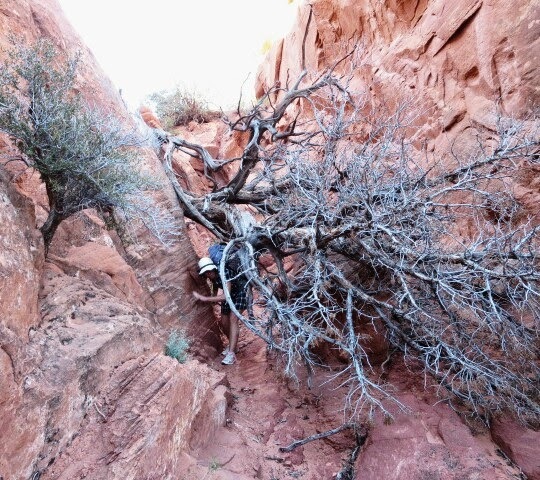 The trail climbed and the heat picked up even more though with little shelter from the low lying desert scrub. 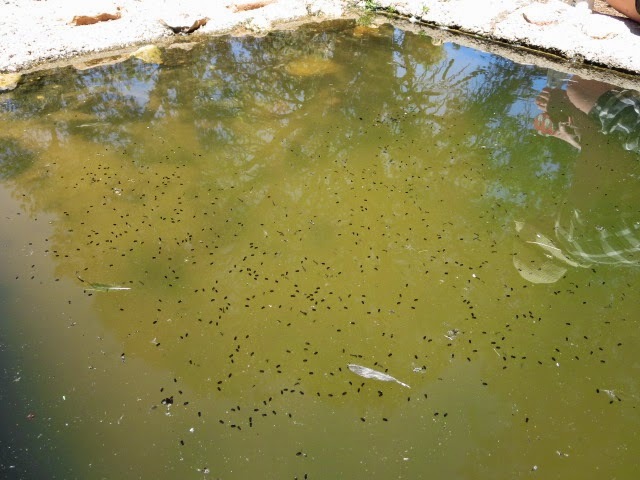 It was a relief to locate our next water source – a big open tank in the pic below- the black dots are mosquito larvae – mostly – which Martina deftly filtered out through her neckerchief. Taking water to do us the rest of today and tomorrow morning to get us to the small resort of Jacob’s Lake, we gradually climbed into high desert forest of the Kaibab plateau on this good trail but with limited views. We were both going well and are hiking fast into the evening although it hurt a bit in the hot conditions on hard packed trail. Interesting to see two raven nests with chicks fairly low down near to the ground in juniper trees and to meet two new types of lizard we hadn’t seen before. Brian’s legs were covered in big welts from insect bites in the morning which were super itchy- he must have got them from being bitten in the evening at Coyote Buttes. We were up early again though and hiking by 7.15 am to catch some cool morning air. A rare thing happened- we met another hiker at 7.30 am- he was doing the Arizona Trail but unfortunately wasn’t chatty so we pass on. Given that we have hardly met any other hikers on this trip it would have been great to exchange hiking experiences with someone else, but – oh well! 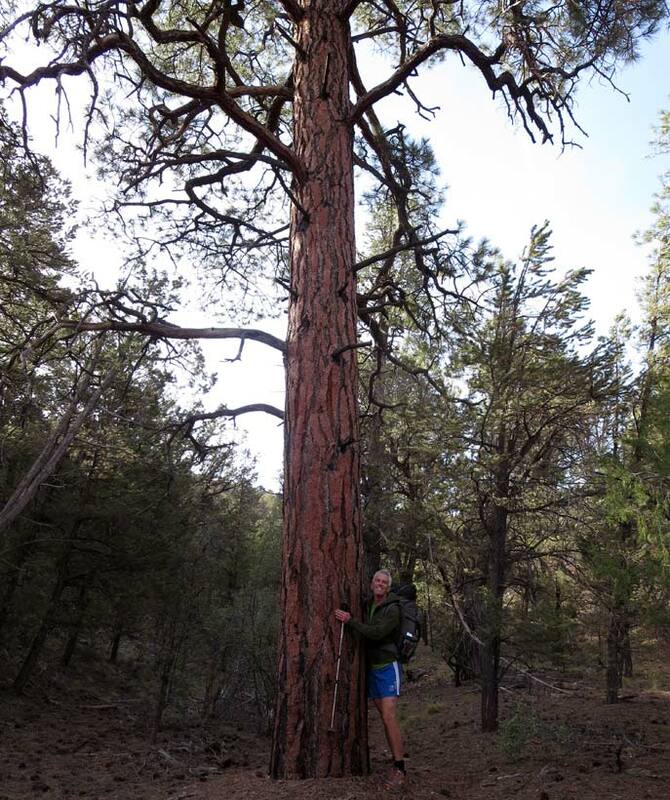 We soon enter into tall ponderosa pine forest at about 7,000 feet which provided some shade and morning air is cooler then yesterday’s hot miles so we made good time. Brian’s itching bites got worse and it seemed a bit of an allergic reaction so we resolved to put our head’s down to make it quickly to Jacob Lake. 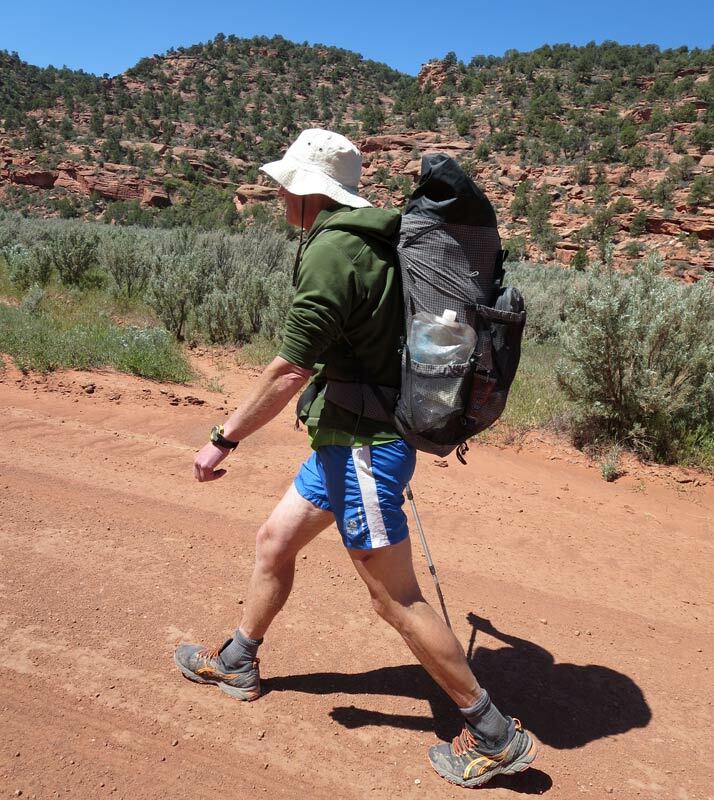 We can then tried and hitch back into Kanab to get to a pharmacy – we also hopefully have new shoes arriving at the post office there. We hit Highway 89A at about 11.15 and hiked the road up to Jacob Lake. Picked up a lift from a Texan couple heading to a Mormon wedding in St George, Utah who drop us off in the small town of Fredonia where we got another lift the final 7 miles to Kanab by a Mormon WiFi engineer. Thanks everyone for the lifts and we enjoyed chatting and finding out about Arizona/Utah!